Insurance companies cajole customers to buy life, non-life and mediclaim policies, but they have hundreds of excuses to reject their claims. For instance, they reject the claim of engine breakdown if the policyholder restarts the vehicle in the monsoon deluge. 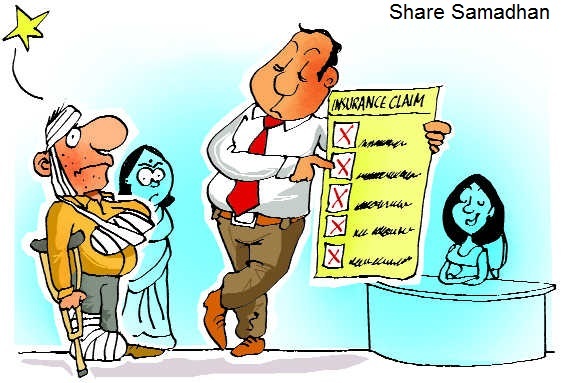 Mediclaim policyholders also face similar situations. Recently, a Chandigarh-based patient, who was admitted to the emergency ward of a private hospital for some gastro-intestinal disorder, was denied cashless facility only because he told the doctor that he takes alcohol once in a blue moon. The third-party administrator quickly showed him the “policy exclusion clause 4.8” and denied the cashless facility. There are ways to get away with such knotty conditions, which customers often ignore while buying a policy. According to Amit Singh, executive director, Palm Insurance Brokerage, "In such case, the policy holders should buy a comprehensive policy with ‘engine protection’ cover, to avoid inconvenience at the later stage". Many insurance experts agreed that agents often conceal such practical issues while selling policies. For the instance case of mediclaim rejection, doctors advise that patients should not disclose alcohol drinking even if it is occasional to avoid the draconian clause. The Insurance Ombudsman office agreed that there is a rise in claim-related grievances. "There has been constant increase in number of complaints filed at Consumer Disputes Redressal Forums and insurance ombudsman. The need to the hour is to bring transparency in the system. At the time of selling policy, terms and conditions are not made clear to the consumers, the consumer comes to know only at the time of settlement," said Share Samadhan co-founder Abhay Chandalia. According to a report issued by the office of ombudsman, Chandigarh, the authority received a total 2,122 complaints in 2017-18. A senior official at the ombudsman office said, instances of mis-selling of insurance products through bank branches are also on the rise. Customers easily give in to the aggressive marketing techniques of some bank employees primarily on account of the trust reposed in the bank. Mis-selling refers to certain ‘unfair business practices’, including wrong sale of product, loading on products and promise of higher returns whereas in non-life, health insurance and motor vehicle cases constituted major portion of complaints. Buy Cialis Coupon side effects. Cialis Ordering Coupon for Cialis medication. Is it safe to mix Cialis and alcohol? Cialis Coupon Can you drink alcohol and take Cialis Coupon? Medication Cialis Coupon side effects. Cialis Coupon Reliable Cialis Generic sites and reviews. Mail Order Cialis Coupon cost. Cialis Best company to buy Cialis Coupon online reviews. Contrast between SEBI and IEPF, Physical share is becoming zero value? Physical to Demat deadline extended till 31st March-2019. Why SEBI should extend Dec 5th timeline on demat of physical shares? Pending Old Share Transfer Cases? Big relief by SEBI for transfer of securities in physical mode.